Sydney ranks in the top 10 most expensive cities in the world, so finding a cheap lunch or dinner is always a win. Nook into one of these hidden spots around the city and enjoy a delicious lunch that’ll leave you with some change for a coffee or two. Find yourself eating like a New Yorker (without the cost of the flight) in the heart of Inner Sydney. 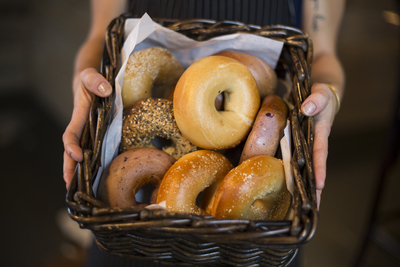 Pick up an authentically made bagel, boiled then baked, on the corner of this cafe nested between terrace houses in Surry Hills. The menu is full of items named after New York’s neighbourhoods and as they’re all under $10, you’ll walk out feeling completely satisfied and full of wanderlust. Tip: Try the “Midtown” to taste one of New York’s most popular meats, reuben. Seriously, just do it. Authentic New York minus having to pay for flights and accommodation; bellisimo. Head to Sydney’s Eastern suburbs for beautiful beaches, great surf and fresh food. Beat the hot weather with Melonhead, a juice bar across the road from Coogee Beach. While not exactly a meal, their gigantic smoothies will leave you feeling fresh, content and ready to hit the beach. The lines can be daunting at first, but this family-owned business serves fast, plays the music loud, extends trading hours in Summer and only charges $7 for a large. Tip: Try the “Honey Bee” for a cinnamon, banana and mango concoction. Venture over the Harbour Bridge and across the spit for one of the best burgers in Sydney. Benbry in Manly serves good old fashioned burgers; a hard find in Sydney’s gourmet burger scene. On Tuesday’s and Thursday’s, $10 will get you a burger, a large chips and a drink. Sit by the beach or the wharf and feel a million miles away from Sydney city. Tip: Choose ‘traditional aioli’ as your sauce. Brewed to the traditional purity of German beer (allowing only 4 ingredients; hops, water, yeast and malt), the handcrafted beers of 4 Pines are some of the best in Sydney. Located across from Manly wharf, take advantage of the happy hour and enjoy a quality beer, straight out of the local brewery. Tip: If you’re not sure whether to go light or dark, or want to try them all, go for the $15 beer flight for 5 beers. 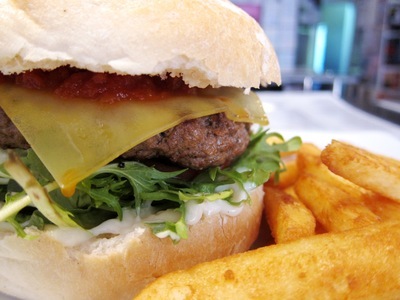 Head to Sydney’s South and try one of Paul’s famous burgers. The shop sits on a hidden corner just off the Georges River in Sylvania and its interior will bring you back late 1950s, when Paul’s first opened. The menu hasn’t changed much since then either (including the price!) and the business continues to be family run. Tip: Try the signature Pineapple Crush to accompany your burger. For the best authentic Vietnamese food, head to Cabramatta in Sydney’s west. Tan Viet is a simple, family run restaurant serving the acclaimed crispy egg noodles. Mix it up and order the mi ga don - crispy skin chicken with egg noodle - for thin, crisp skin, tender chicken and the perfectly cooked egg noodle. Tip: Get in early for dinner on the weekends to avoid lining up along John Street. The Lebanese restaurant that started in Granville in 1998 has since spread to Blacktown and Punchbowl, drawing crowds with it. The charcoal chicken is some of the best in Sydney and while the menu is simple, the flavour hit (especially in the garlic sauce) will keep you coming back. For a meal under $10 (including a side of Lebanese bread), there’s no reason why you shouldn’t. Tip: You’ll need more garlic sauce. Open from 4pm onwards, right in the heart of Sydney city, Frankie’s is the perfect spot for a New York inspired pizza slice and a beer. Every slice is $5 and they don’t cut any corners. The slices are huge and loaded with toppings like prawns, chorizo, bocconcini and jalapenos. Tip: Get in early on a Friday or Saturday night to grab one of their popular American style diner table. You might want to check into a hotel after the meal.